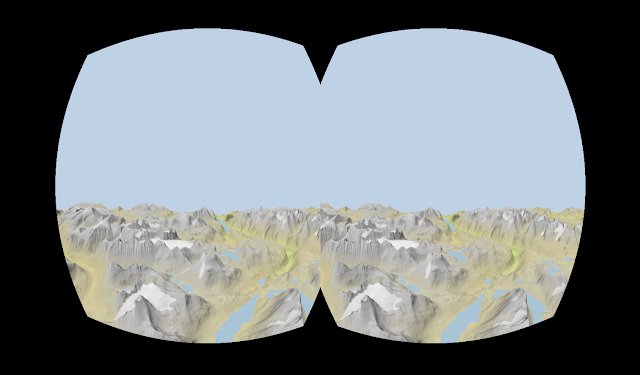 My good colleague, Harald K. Jansson, owns an Oculus Rift headset, and he couldn’t resist creating a virtual reality version of my 3D map of Jotunheimen. It’s very impressive, especially when you know that everything runs in the browser. If you’re lucky enough to own a Oculus Rift headset you can try yourself by clicking on the image below. THREE.OculusRiftEffect by troffmo5 used to render the scene in stereo 3D side by side with lens distortion. THREE.OculusControls by possan to allow head tracking. You need to fire up a HTTP server yourself to get head movement data from the headset. The code is avaiable on GitHub. Enjoy!